5つ星のうち5.0A review? ? ? 50% Lack of Knowledge---50% just Poor Writing--a MUCH BETTER Adendum MAY follow. 03-25-2015 This is an RCA Victor recording of the two Clarinet Sonati of Johannes Brahms. they are the #1 in f minor, Op.120, #1 (23:18) and the 2nd Sonata for the same instruments, in E Flat #2 of the same opus number (21:34). Our players are clarinetist Richard Stoltzman and pianist Richard Goode. Also extent are the transcriptions of these works, scored for viola and piano, of which I have a recording. But, thus far, I prefer the sound and tone of the clarinet, being unique in the chamber repertoire, and even more so in Concertante form, Mozart's Concerto in A being the leader is quality, popularity and musician's preferences. Both of these Sonati were captured in 1981, in DDD technology. The very first thing I noticed is the similarity of the first bar or two of Sonata #1 in f minor with the initial Piano Quartet, written in 1861, they year before the Clarinet pieces. Yet, this is a fairly rare example of borrowing ideas from previous works, although many composers did just that. However, such was the wealth of singular and unique musical ideas and concepts that Brahms may have Borrowed less than ANY one else. My few measly bucks are on him, L.O.L. Without focusing on this second hand material, the composer moves on to his main theme, a mix of quickness and mournful lamentation. "Autumnal?" you say??? Well, let us remind ourselves he could wrote "old" music even before age 30, but it seldom was sad, tragic or remorseful stuff. Instead, it felt comforting, soothing, and sincere in it's intentions. The GREAT example is, of course, "Ein Deutsches Requiem, " the masterpiece of his 35th year, and certainly, one of his top 3 compositions. The opening 8 minute "Allegro appassionato" has some disjointed ideas and it isn't the smoothing 8 minutes in all the catalog, but I will have to study it more, as I am very new to this Op. 120, currently. Where we really hear the artistry and greatness of both Brahms, AND our soloist, Mr. Stoltzman, is n the 5"30 Andante un poco;Adagio". playing any wind instrument this softly, without the safety net of a good engineer, is risky business to say the least, but RS pulls it off as though it were his own composition. Never a hesitation, bobble, or second of uncertainty. Purely rendered all the way through. So, at a mere 5:30, why should anyone have trouble? Well, there are,, I hear, funny things about live performances, even by the greats, in art, such as Olivier, Horowitz, Heston, Edward Robinson, etcetera, etcetera, etcetera ! ! ! The Scherzo is fairly subdued and tonally quieter than the earlier movements. Much of this music, including the F Major next Sonata is relaxed, soothingly calm music. Brahms was never brash, vulgar, offensively loud, boisterous nor bombastic. If that's your cup-of-tea, turn to Liszt or Prokofiev, for starters. The final segment is the ending "Vivace," traversing a short 5:02, and it has some dazzling moments. Overall, liked the #1 quite well, however, since this is probably only my 3rd or 5th hearing, I need to let it grow in my mind and surely all of this great amn's music has done, over the any years. The Sonata in F Major, op. 120, #2 closes this RCA CD with a three movement, shorter work, running a sprite 21:34. As in the first Sonata, this second one was also recorded in 1981, and, by the way, this cd received a Grammy for Best Chamber performance in 1983. With Mizuko Uchida, he is co-Artistic Director of both the Marlboro Music School and the younger annual Festival. This entire CD has but one "flaw." It is too short. RCA should of included some extra tracks, say of some of his songs with Dawn Upshaw or samples of his work with the great Alexander Schneider. BUT, if you can catch one for only a few bucks, I say grab it, yet to miss out on our soloist's playing by this, Nebraskan, would be a "musical crime". Mr. Stoltzman is obviously of Germanic ancestors, as are gobs of his fellow "Cornhuskers." I'm sorry about the short and maybe not very good review of Sonata #2, but my gross unfamiliarity with it, leaves me no honest, alternative. Still, my warmest regards and best wishes. God bless you, and yours, Tony. P.S.------A fair but maybe off the mark 3.50 Stars nd a mild recommendation from this AMATEUR Reviewer. Perhaps I may be able to post a much better written adandum some day. Again, God bless all, Tony. My collection includes several versions of this. For sheer understanding of Brahms at his Op 120, this stands very high indeed. 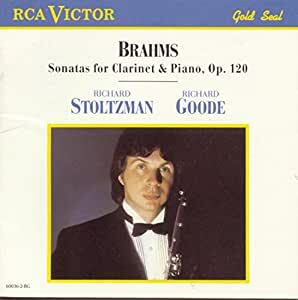 I have both the Harold Wright and Stoltzman CDs of the Brahms Sonatas, and I personally prefer Stoltzman's version (since I'm reviewing Stoltzman, I'll avoid comparison with Wright as much as I can). Many complain that Stoltzman doesn't get the nuance of Brahms music and that he over-plays... Frankly I don't see it. His playing exudes passion and fury in the more passionate moments of the Sonatas (1st mov. of Sonata 1 and 3rd mov. of Sonata 2 in particular). In the more delicate work (such as Sonata 1, mov. 2), Stoltzman's style (though less subtle than some) is engaging. The best way I can describe these recordings (and much of Stoltzman's work) is that when I hear him play, I become absorbed in the music. I might admit that there are a few spots where one could argue that his vibrato could be toned down or something else like this, but this minor issues fail to subtract from the overall engrossing experience of listening to his playing. Other players (such as Wright) may play in a more reserved, traditional manner, but I can't get lost in their playing. It usually just leaves me luke warm. No one CD is perfect, and you could pick apart a passage here or there on any recording by any artist. 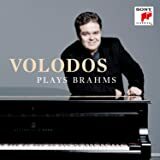 However, as an overall experience, I don't think you'll hear a more passionate or engaging Brahms than this recording. Those who listen to this recording and spend the whole time nit-picking minor things are missing the big picture (and it's a beautiful one). Earlier this month, I drove the 27 miles from Montpelier to the Randolph Chandler Hall to hear Stoltzman perform a selection of works ending with the Opus 120 # 1 Brahms Clarinet Sonata. He had an excellent pianist, Simone Dinnerstein accompanying him. The evening was a spectacular one, with riotous applause from the small but knowledgeable audience. The Brahms piece was played masterfully. As someone said in a review of another of his dics, "Stoltzman is the best clarinet player on the planet right now." Almost all of the members of that audience would have agreed. I have the Stoltzman - Goode version of the two sonatas. These were recorded when both artists were very young and are both now highly respected artists who have continued to develop musically. But their effort of 30 years ago or so remains a jewel. I have four other versions of these sonatas played on the clarinet and two versions played on the viola. All are good, but the Stolzman - Goode version is the best of the clarinet sets. Some of the reviewers here are critical of Stoltzman and claim he goes too far. But not everything needs to be played in the classical style of Mozart, Haydn or Beethoven. Remember, the Opus 120 set was composed towards the end of Brahms life. He died in 1897. He is also considered a late Romantic composer. Writing music at the same time and continuing after his death was Gustav Mahler. And Schoenberg came right after. Stoltzman plays these sonatas just right for the time and the style. They are meant to be expressive and powerful pieces and that's the way they sound. I would recommend this set highly. I don't think it can be beat if you love Brahms and you love the Clarinet.